When a child with autism is first diagnosed, we parents are all familiar with the frantic nature of the search for treatment. The physician or psychologist lands the bombshell and then says, “early intervention” is key. But what kind of intervention? The parent is left hanging, not knowing what to do. Some of the first stories parents hear about often include a child who didn’t talk until late but made it far enough to be a university professor today. Parents and relatives go on a fact finding mission to get advice from people with Autism Spectrum Disorder who are accomplished. We try to glean an understanding of the disorder. Since autism is now so prevalent, every day there are more adults with ASD giving their personal testimonials. Today, in fact, I came across the latest testimonial sponsored by Autism Speaks. The author of the piece has only the best of intentions for parents; he encourages every person with autism spectrum disorder to share their stories. Unfortunately, hopeful testimonials from adults on the autism spectrum may be very misleading. These adults who are eloquent enough to be in university or graduate school, probably have Asperger’s syndrome and share very little in common with a child diagnosed with autism; in short, their developmental trajectory may be very different. In addition, the research is clear that no one has the proverbial crystal ball to tell you what your child is going to be like as an adult. Even experts in the field cannot predict outcome. 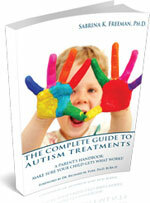 The only statement with which most can agree in the autism field is that early intervention is the key. Those who have respect for science and understand the state of the science in autism treatments, will all agree that Intensive Early Behavioral Treatment (EIBI) is the key to success. The studies that have been produced by EIBI researchers make it clear that it takes a few years before any kind of reliable prediction can be made as to 1) whether the child will lose the diagnosis of autism and if not, 2) where the child will be as an adult in terms of independence, capability, and general happiness. Advice to new parents: forget about the testimonials provided by well-meaning people who have never met your child and get thee to a qualified, behavioral consultant with expertise in Early Intensive Behavioral Treatment! You’ll never look back.